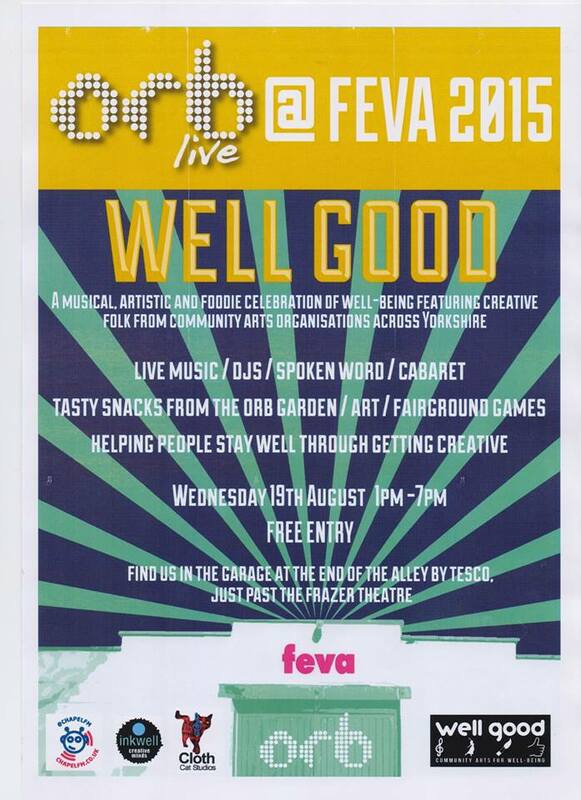 Orb’s annual open afternoon takes place on Wednesday August 19th, as part of Knaresborough’s yearly FEVA festival. Running from 1pm to 7pm at Orb HQ, just past the Frazer Theatre, this free event will be a celebration of community arts and mental well-being, showcasing the talents of Orb members and creative folk from similarly minded organisations across Yorkshire. In our main performance space, you will be able to enjoy a wide range of talents: from live music to multi-media cabaret, interspersed with DJs and spoken word performances. Works from our art groups will be on display, and food will be available, including produce grown in the Orb garden. In the forecourt, there will be stalls and fairground games, to inform and amuse our visitors. On the live music front, the Field Orchestra of Found Sound will be performing their own self penned multi media piece, as formulated during their weekly evening sessions. Once again, the music will be enhanced by visual backdrops, and ambient field recordings made in various Knaresborough locations. To give you an idea of what to expect, take a look at this video of their last show, at July’s Get Creative celebration event. We will also be enjoying the work of Jamie Bevan, a talented singer-songwriter from our area who recently performed a couple of community arts events in Leeds. Here’s Jamie in action at the first of those shows. Elsewhere on our line-up, Kerry Graham will be sharing some extracts from her self-penned musical “Chasing The Time”, the story of a man who runs a clock shop. Concluding the bill, Orb’s cabaret group, under the direction of Sophie Walsh-Harrington, will be presenting a specially written show. Inspired by shared personal stories from a wide range of Orb members, the players have stitched these stories into a weird and wonderful patchwork of songs and sketches, reflecting a shared journey towards liberation and free self-expression. Sometimes poignant, sometimes hilarious, this promises to be a unique and unforgettable experience! For Orb volunteer Mike Atkinson, last year’s FEVA open day provided an ideal opportunity to see at first hand what we offer, to learn about the services we provide, to understand the principles which guide our work – and to offer his own services to our organisation. As the first anniversary of his involvement approaches, Mike hopes that others will feel similarly inspired to step forward and lend a hand. “If you had told me a year ago that I’d be singing in a cabaret show at the FEVA festival, in a blonde wig and a feather boa, I’d never have believed you!” he says. This year’s event also features acts from three other community arts organisations, who are all similarly committed to individual and community well-being through creative endeavours. Based in inner-city Leeds, Cloth Cat “uses music training to help local people improve the quality of their lives”. Also based in Leeds Inkwell are “a creative and innovative mental health service, offering a range of classes and activities for the wider community and service users experiencing mental health difficulties.” They are joined by Chapel FM, the first ever live arts centre in East Leeds. Together with Orb, all of these organisations have recently joined forces to form the “Well Good – Community Arts for Well-Being” initiative, whose launch has been marked by a series of collaborative live events over the summer. Orb’s FEVA afternoon will be the third of these events, which aim to promote the sharing of skills and knowledge, as well as giving enhanced opportunities for service users to perform in new places, and to interact with more people along the way. 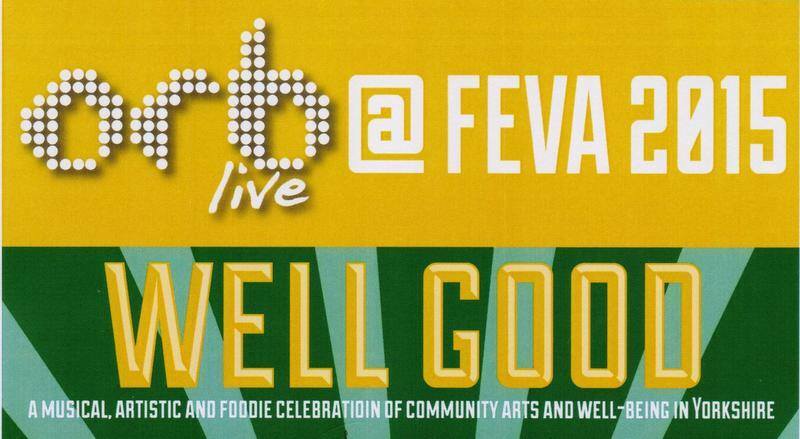 As we prepare to throw open the double doors at the front of Orb HQ, and to welcome everyone from our wider community to this wide-ranging showcase of our work, we hope our FEVA day will be entertaining, educational and inspiring. Perhaps we’ll see you there?